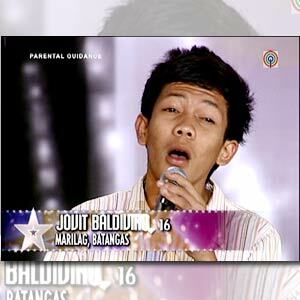 36 contenders, including Jovit Baldivino (in photo), are aiming to reach the next round in ABS-CBN’s talent-reality show Pilipinas Got Talent. They sang, they danced, they peformed, and they wowed the judges. Thirty-six out of the 220 talented Pinoys made it to the semi-finals round of ABS-CBN’s talent-reality show Pilipinas Got Talent. They will be competing not only for the judges’ nods, but more importantly, the people’s votes to win starting Saturday (May 1). Some of the semi-finalists have become Internet stars with their audition videos garnering as many as 3.5 million views in YouTube, while others have received invitations to perform in various events nationwide, including political rallies. Trimming the list to 36 was no easy task for judges Kris Aquino, Ai-Ai delas Alas and Freddie "FMG" Garcia. Of the 36 semi-finalists, 17 contestants came from NCR and Luzon, while 19 came from the Visayas and Mindanao. Since its launch in February 2010, Pilipinas Got Talent has shown a diversity in the impressive performances by young and old contestants across the country like a group of "goldies" who gracefully danced and impressed the judges, a daughter who sang to win her dad’s approval, a ventriloquist who charmed the judges with his act, among others. The Luzon semi-finalists are the Baguio Metamorphosis, Alex Carpena, Powerpuffcorn, Kapidamu Band, Allan De Paz, Markki Stroem, Garrett Bolden Jr., Joel "Big Mouth" Amper, Ingrid Payaket, Ma. Jeline Oliva, the Velasco Brothers, Reinel Tulabing, the Imusicapella Chamber Choir, Geraldine "Fame" Flores, Keith Clark Delleva, Ruther Urquia, and Jovit Baldivino. Goldies n’ Goodies, Jzan Tero, Mae Lozada and Anselmo Estillore, Josephine Aton, Carl Malone Montecido, Manolito Saldivar, Luntayao Family Singers, Jhistine Baguio and Filemon Baguio, and the Snap Boiz, on the other hand, will proudly represent the Visayas. Mindanao acts Harold Gesulga, dance group Hello World, Reggie Ramirez, Florante Castino Inutan, Experience Kidz, Sherwin Baguion, Ezra Band, Rolando Ng III, Xavier University Cultural Dance Troupe, and Rolando Permangil are also set to show what Pinoys from Mindanao got as they also enter the next round. Starting this Saturday, May 1, viewers can catch Pilipinas Got Talent semi-finals live at the AFP Theater, Camp Gen. Emilio Aguinaldo, Quezon City. Every week, six contestants will battle it out and only two will be chosen to go through the finals. The contestant with the highest number of votes is automatically through to the next round. It is then up to the judges to choose who between the second and third placers in the text and online votes will be advancing to the final leg of the competition. This Saturday, the first batch of semi-finalists who will go face-to-face for your votes are Jovit Baldivino and Ruther Urquia of Luzon, Jhistine and Filemon Baguio and the Snap Boiz of Visayas, and the Xavier University Cultural Dance Troupe and Rolando Permangil of Mindanao. Who will make it to the next round? Don’t miss the start of the semi-finals of Pilipinas Got Talent this Saturday (May 1) live at the AFP Theater, Camp Gen. Emilio Aguinaldo, and on Sunday (May 2) live at ABS-CBN Dolphy Theater (Studio 1). To avail free tickets, simply go to ABS-CBN Center Road from April 27 to 30, at 1:00 to 4:00 p.m.